Whether fatigue, stress, or boredom are behind your concentration problems, if unchecked, they can grow into an obstacle to your productivity throughout the day. Your ability to focus on complex - or even simple - tasks becomes obstructed by a wandering mind and reduced cognitive ability. At times, this symptom may be scary, because the mental fog can become thick enough to resemble Alzheimer's or other types of senile dementia. 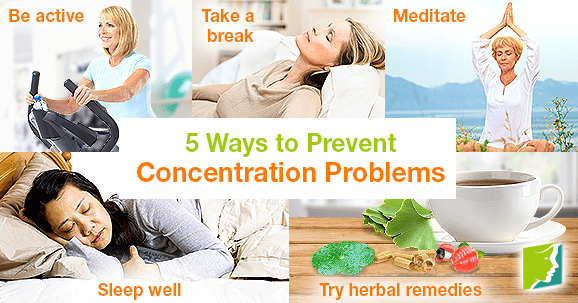 However, concentration problems are very common during menopause - as they stem from a fluctuation in hormonal levels and are often worsened by accumulated stress - but they can be easily prevented. When you move around, it improves oxygen flow to the brain, which directly increases your ability to concentrate. On the other hand, being sedentary breeds more fatigue and can make you feel sluggish. Walk as much as possible around the office, taking extra trips back and forth from your desk. Other little adjustments you can make include using the stairs, walking instead of driving when possible, and adding two to three hours of cardio exercise to your week. If you don't take a break, then your whole day will be a break to some degree, and you won't be able to give 100% to your many tasks. Instead of letting your mind wander for hours, focus intensely for 45 - 60 minutes, and then relax your mind by sitting back and listening to a song, taking a short walk, or splashing your face with some cool water. This will help refuel you to continue your work proactively rather than being unengaged. Meditation is a great way to develop a deeper ability to concentrate. With all the worries building up in your mind, it will be hard to value the moment and pay attention to what is occurring in the present. Around 20 minutes of meditation daily can help you release concerns and appreciate the opportunities available for you. Turn on ambient music, close your eyes, and let each inhale balance your mind, while each exhale releases negative thoughts. Sleeping well means not under-sleeping or oversleeping, but getting just the right amount of pillow time. Experts indicate that eight hours is the perfect amount to maintain focus. When you're tired, symptoms of forgetfulness tend to get worse, and it will be harder to be sincerely interested in anything. When you oversleep, on the other hand, you can become prone to procrastination, and your attention span may shorten. In order to develop healthy sleeping patterns and a consistent rhythm, go to bed and wake up at the same time each day. Herbal teas and supplements like guarana, ginkgo, gotu kola, and Siberian ginseng are stimulants that enhance nervous system function and boost brain activity. Look for supplements aimed at energy, proper circulation, or mental relaxation. Staying in the moment and focusing on personal and professional tasks can be difficult, especially during menopause, since your hormone levels are fluctuating. However, as you start to get into the flow of good attention-promoting habits, you will notice a distinguishable difference in your ability to concentrate. Click on the following link to learn about difficulty concentrating and the different ways to treat it.